[Richard] Nixon: More self-determination would mean more nations. Kissinger: That applies—they’ll apply that to Mozambique and South Africa. They won’t apply it to black [unclear]. In October 1975 Tunisian president Habib Bourguiba, speaking to the French newspaper Le Monde, remarked on the controversy surrounding the future of the Spanish Sahara (Western Sahara), then claimed by Morocco and Mauritania. “Self-determination for 40,000 nomads?” he asked. “Let’s not exaggerate.” Western Sahara was “a little phantom state” best absorbed by its neighbors lest it destabilize the region.2 A few weeks later, following a massive march to the border of the territory by hundreds of thousands of Moroccan citizens and a veiled threat of invasion, the Spanish government negotiated the handover of Western Sahara to Morocco and Mauritania, a move resisted by the armed, Algerian-backed Polisario independence movement. The predictable panoply of human rights abuses (as understood in the West, at least) followed: forced displacement of ethnic Sahrawi, arbitrary arrest and imprisonment, torture and murder, little noticed because they took place in a territory whose claim to self-determination remained unresolved and in the context of what the Polisario termed a war of national liberation. The connection was not lost on the United States ambassador to the United Nations, Barbara White, who that same month spoke before the Third Committee of the UN General Assembly on “the importance of the realization of the universal right of peoples to self-determination.” Invoking the Americans’ historical experience as a model, she noted that “achievement of self-determination must mark renewed efforts to guarantee human rights and the dignity of the individual.”3 In other words, where self-determination is achieved, human rights can begin. Yet the United States would exhibit a studied ambiguity on the question of self-determination in Western Sahara, as in East Timor, Palestine, and many other places where the denial of self-determination and other human rights abuses were directly connected, and just as it had bitterly opposed inclusion of a right to self-determination in the United Nations Charter in 1948. It is no coincidence that the final collapse of European colonialism in the early 1970s paralleled the explosion of individual-based human rights activism in Europe, the United States, and elsewhere, or that postcolonial states and anticolonial movements continued to insist that collective self-determination broadly construed was the “first right” from which all other human rights derived.4 Kenneth Cmiel, however, has observed that Western nations in the 1970s “did not agree that this was a fundamental human right,” often viewing movements for self-determination as the untidy leftovers of state-building anticolonial campaigns of previous decades and threatening in the expansive claims made on its behalf. Historians of human rights mostly agree, consigning self-determination to the history of decolonization. Those who have explored their intersection, most recently Roland Burke, offer a declensionist narrative in which liberal, democratic visions of self-determination among the first generation of postindependence leaders in the 1950s gave way to the “organized hypocrisy” of authoritarian states in later decades, which used self-determination claims as a shield rather than as a sword.5 Instead, the historical human rights literature emphasizes the emergence of local, national, and transnational movements for individual human rights in the postwar period and especially in the 1970s. Yet the latter, I will argue, is deeply connected to the former. The end of formal European colonialism, by delivering the “first right” to the vast majority of the world’s peoples, made possible the strategic embrace by the West of individual human rights and facilitated the explosion of rights activism. At the same time, even as the era of formal European colonialism shuddered to an end, the United States, Great Britain, and other former colonial powers sought to contain the principle of self-determination as a human right along imperial lines, so as to continue restricting its meaning to the anticolonial and political sphere, rather than the realm of cultural rights or, more dangerously, international economic relations. Yet, like human rights more broadly, the meaning of self-determination as a human right in the 1960s and 1970s was fractured and contested along lines that transcended neat East-West or North-South divides. Despite a wealth of scholarship exploring the explosion of transnational human rights organizations and the institutionalization of norms in state bureaucracies and multilateral forums, historians have largely told a story of diffusion of civil and political rights, generally radiating from the West outward, with origins ranging from the French Declaration of the Rights of Man in 1789 to Ship Harbour, Newfoundland, in 1941.6 The human rights history of the period, however, looks quite different if refracted through the lens of self-determination rather than civil and political rights, shifting the focus of our gaze from Latin America and the advanced industrial states to Africa, the Middle East, and South Asia, and from Western parliaments and NGOs to multilateral institutions and the diplomacy of the Nonaligned Movement and G77. A reexamination of the contested politics of self-determination in the late 1960s and 1970s suggests there was no single “human rights movement” with a clear set of goals or even a rough consensus on what constituted core human rights. Rather, like other contested human rights norms, the meaning of self-determination emerged from political, ideological, and sometimes even military conflict, with a multiplicity of actors seeking to enlarge or constrain it to suit their own purposes. 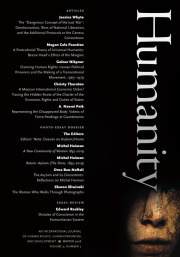 Reframing the history of human rights in this fashion challenges the teleological, self-referential, and self-congratulatory story that scholars have previously told about the emergence of campaigns against torture and political imprisonment as the main focus of human rights politics during the 1970s. Instead, this essay treats the human rights politics and discourses of the decade as an ongoing contest in which alternative conceptions of rights, especially the right of self-determination, were rejected by the former colonial powers or subordinated as a result of often bitter political conflict within and between state bureaucracies, international forums, and NGO boardrooms. Over the next few years, newly independent and socialist states advanced a blizzard of initiatives within the UN system, further solidifying the link between anticolonialism, self-determination, and human rights. Much of this activity was focused on the Israeli occupation of Palestinian territories and on southern Africa, where the triple evils of white supremacist rule in South Africa and Rhodesia, Portuguese colonialism, and South Africa’s annexation of South-West Africa served to radicalize discussion of human rights in multilateral forums. The incorporation by newly independent states of human rights discourses within the framework of anticolonialism and self-determination exposed the vast gulf between their understandings of rights and those proffered by Western governments and the NGOs which began to spring up alongside them in the late 1960s and 1970s. On no issue was the distinction clearer than the question of armed struggle, which the United States, Britain, and other states rejected as a matter of course—unless they were doing the arming—and which liberation movements, postcolonial states, and socialist states defended with sacramental fervor, unless claimed by restive internal minorities (Biafra, Bangladesh), occupied peoples (Palestine), or unruly satellites (Hungary, Czechoslovakia). A succession of disputes within the ECOSOC Committee, the Decolonization Committee, the Terrorism Committee, and the Legal Committee on Armed Conflicts reveals a terrain of debate over the meaning of human rights and terrorism almost wholly alien to liberal sensibilities, especially those of Western liberals who, for principled or practical reasons, focused their attention on those victims of human rights abuse in other countries who forswore violence as a means of social change. The years 1974 and 1975 did mark a turning point of sorts. Portugal’s Carnation Revolution of April 1974, which ousted the Estado Novo regime, prompted its successor to declare the right of its former colonies to self-determination and begin a pell-mell retreat from empire which would lead to civil war and superpower intervention in Angola and Mozambique, independence for Guinea-Bissau, and an Indonesian invasion of East Timor in December 1975. In April of that year the Vietnam War finally ended as North Vietnam forcibly reunited the country, ending Washington’s two-decade-long effort to create largely out of whole cloth an independent, anticommunist state called South Vietnam, whose existence a succession of U.S. administrations justified with reference to South Vietnam’s right to self-determination. And in August 1975 the Conference on Security and Cooperation in Europe issued the Helsinki Final Act, ratifying the postwar settlement of Europe and adopting the UN’s 1970 Declaration of the Principles of International Law, including the famous political Trojan horse of human rights and self-determination that would galvanize European activists. Between 1974 and 1976 Cape Verde, the Comoros, Sao Tome and Principe, Mozambique, Angola, Samoa, the Seychelles, Suriname, Papua New Guinea, and Guinea-Bissau joined the UN, the last burst of independent states until the end of the Cold War and the collapse of the Soviet Union. The achievement of self-determination, in form if not in substance, by the vast majority of the world’s peoples formerly living under colonial rule (with significant exceptions in Rhodesia, Southern Africa, and Palestine) also marked a turning point in the history of the global discourse of human rights. Describing U.S. secretary of state Henry Kissinger’s September 1975 speech to the United Nations on the challenges of interdependence, Daniel Sargent argues that “even in this moment, Kissinger did not explain how human rights would be reconciled with `the triumph of the principle of self-determination and national independence’ as guiding principles of international relations.”27 However, it was precisely in those places where self-determination had already triumphed, or had been acknowledged by the great powers, that liberal human rights could now be reconciled. The State Department acknowledged as much when UN ambassador Patrick Moynihan submitted to the UN’s Third Committee a draft UNGA resolution appealing for the release of all political prisoners (at least those the United States recognized as such). The draft resolution, negotiated by Moynihan with the U.S. congressional human rights activist Rep. Donald Fraser (D-Minnesota), pointed to the Helsinki Final Act as “concluding an era of political strife and international tension in Europe” and noted the great progress achieved in “ensuring the right of self-determination for peoples everywhere.” Now that “a new era of cooperation and political amity between nations is emerging . . . this lessening of international tensions makes derogations by states of the rights of peoples to exercise their human rights even more unjustifiable.” One political scientist argued that the United States would not be able to focus on human rights, what she termed “individual self-determination,” until it had severed the false connection between human rights and national self-determination.28 Most newly independent states, however, having achieved the “first right” of self-determination, now hoped to wall themselves off from the prying eyes of those in the international community who would shift their gaze from the collective rights of liberation movements to the individual rights of citizens. Sovereignty, now that they had it, would be absolute, the missives of human rights activists intolerable interference in their internal affairs. The following March, in a special session of the Economic and Social Council, the Group of 77, led by Iran, issued a declaration of principles for the establishment of a New International Economic Order (NIEO) to accelerate the development of poor countries and close the widening gap between them and the industrialized world.51 The declaration served as a potent counterpoint to Kissinger’s address to the 28th UNGA on interdependence, reiterating the language on self-determination, sovereignty, control over natural resources, and the right of nationalization of previous UN statements, couched in the language of human rights and anticolonial nationalism. The NIEO represented the high tide of efforts by the Nonaligned Movement and Group of 77 to use the UN machinery to build political solidarity and consensus around a restructuring of international economic relations, prompting lots of hand-wringing in Washington, London, and other capitals over how to identify and exploit differences among Nonaligned Movement and G77 members.52 Over the course of the next year, the foreign ministers of the Nonaligned Movement, meeting in Lima in August 1974, recommended a program of action to rein in the activities of multinational corporations which violated human rights and self-determination of peoples. After more than two years of negotiations dating back to 1973, the UNGA in December issued a Draft Charter on the Economic Rights and Duties of States (CERDS) rooting human rights in equal development, self-determination, and the creation of the NIEO. And 1975 witnessed a flurry of discussions and declarations, building on and referencing the famous Church Committee hearings on multinational corporations and United States foreign policy, in order to emphasize the need to rein in the power of MNCs, especially those investing in and indirectly working to support racist regimes in Rhodesia and South Africa that violated the rights of their citizens.53Nonaligned Movement solidarity on the creation of an NIEO and other issues was always fragile, masking deep economic and political differences among member states, which emerged starkly in the wake of the oil price hikes of the 1970s and the massive wealth transfers from non-oil-producing states that these produced. But the grounding of calls for an NIEO in terms of human rights and self-determination marks a striking repudiation of Western discourses of individual human rights. More than thirty years after the end of formal European colonialism, the international community continues to confront self-determination movements in the Southern Sudan, Kosovo, Spain, Western Sahara, Belgium, the Palestinian territories, the Kurdish regions of four countries, Russia, and many other areas. These are clearly challenges that will persist for the foreseeable future, and many such movements have deep historical roots and analogs. Yet self-determination’s history remains poorly understood, and the principle itself the subject of widespread anxiety. I have attempted to do no more than survey some of the myriad ways in which states and movements deployed claims to self-determination as a human right, and some of the contested, even contradictory meanings accorded self-determination on all sides of East-West and North-South divides, especially regarding questions of economic self-determination. There was no single discourse of self-determination, any more than there was a single discourse of human rights. This initial foray has raised more questions than it can answer in this short space, among them: was the ideological commitment of Third World states and movements to self-determination genuine, or was it merely a discourse to be appropriated for instrumentalist purposes? Did self-determination claims substantively shape struggles for decolonization, human rights, and self-rule in the post-1945 period, or merely reflect them? Though it is tempting to see self-determination as simply a free-floating discourse, the implications of debates over its scope and meaning were not merely rhetorical. It had a materiality that helps to explain the bitterness of struggles conducted in its name. The growing status of self-determination in international law was both shaped by and reshaped the United States and UN response to decolonization movements in India, Indonesia, Algeria, Fiji, and many other places. In the late 1960s and early 1970s, as it achieved growing status and legitimacy in the United Nations, indigenous communities in the United States, Canada, Australia, and other advanced industrial countries began mobilizing to demand economic, linguistic, and cultural self-determination. An upsurge of Native American activism in the United States led to passage of the Indian Self-Determination and Education Assistance Act of 1975, which provided a new framework of relations with the federal government, paralleling similar movements around the world.57 In some cases such claims challenged the legal and political prerogatives of multinational corporations and the existing framework of North-South economic relations, by insisting, for example, that self-determination encompassed economic sovereignty and control by states over their natural resources, or when Latin American states nationalized foreign mining and extractive firms in the 1970s.58 The response of governments to these movements revealed the thickening of state and multilateral mechanisms for adjudicating self-determination claims as the colonial era drew to a close. The history of self-determination claims and movements does suggest that a more critical and robust history of human rights in the 1970s would do well to take its cues from the priorities and initiatives of states, movements, and activists in the Global South, and to develop a research agenda which would make it possible to more fully recover their sometimes cacophonic voices, rather than treating them as the false echo of their liberal, imperial precursors in the United States and Western Europe. 1. Memoranda of Conversation, President Nixon and Henry Kissinger, September 23, 1972,Foreign Relations of the United States, 1969–1976 (hereafter FRUS), vol. E5, part 1,Documents on Sub-Saharan Africa, 1969–1972, Document 223. 2. Telegram 28443 from U.S. Embassy Paris to State Department, October 31, 1975, State Department FOIA Electronic Reading Room, Central Foreign Policy Files, 1973–1976. For more generally, see Jacob Mundy and Stephen Zunes, Western Sahara: War, Nationalism and Conflict Irresolution (Syracuse, N.Y.: Syracuse University Press, 2010). 3. Telegram 4928 from U.S. Mission United Nations to State, October 10, 1975, State Department FOIA Electronic Reading Room, Central Foreign Policy Files, 1973–1976. 4. Rupert Emerson, “The Fate of Human Rights in the Third World,” World Politics 27, no. 2 (1975): 204; Andrew J. DeRoche, “Standing Firm for Principles: Jimmy Carter and Zimbabwe,” Diplomatic History 23, no. 4 (1999): 657–85; Press release No. 288/1006, June 28, 1977, Permanent Mission of Republic of Indonesia to the United Nations, Message from H. E. Adam Malik, “On the Occasion of the Commemoration of the International Day of Solidarity with the Struggling People of South Africa,” ETAN Papers, box 14, Tamiment Library, NYU; Telegram 9779 from Embassy in Addis Ababa to State, August 14, 1975, Department of State FOIA Electronic Reading Room. 5. Roland Burke, Decolonization and the Evolution of International Human Rights(Philadelphia: University of Pennsylvania Press, 2010), 35–59; Stephen D. Krasner,Sovereignty: Organized Hypocrisy (Princeton, N.J.: Princeton University Press, 2000). 6. Lynn Hunt, Inventing Human Rights: A History (New York: Norton, 2007); Elizabeth Borgwardt, A New Deal for the World: America’s Vision for Human Rights (Cambridge, Mass. : Harvard University Press, 2005). 7. Most recently, see Stefan-Ludwig Hoffmann, ed., Human Rights in the Twentieth Century(Cambridge: Cambridge University Press, 2010); Akira Iriye, Petra Goedde, and William I. Hitchcock, eds., The Human Rights Revolution: An International History (Oxford: Oxford University Press, 2012). 8. David C. Gordon, Self-Determination and History in the Third World (Princeton, N.J.: Princeton University Press, 1971); Erez Manela, The Wilsonian Moment: Self-Determination and the International Origins of Anticolonial Nationalism (Oxford: Oxford University Press, 2007); Jörg Fisch, Das Selbstbestimmungsrecht der Völker oder die Domestizierung einer Illusion: Eine Geschichte (Munich: Beck, 2010); Mortimer Sellers, ed., The New World Order: Sovereignty, Human Rights and the Self-Determination of Peoples (Oxford: Berg, 1996); for a review of recent literature, see Jan Eckel, “Human Rights and Decolonization: New Perspectives and Open Questions,” Humanity 1, no. 1 (2010): 124–48. 9. Roger Normand and Sarah Zaidi, Human Rights at the UN: The Political History of Universal Justice (Bloomington: Indiana University Press, 2008), 212–20; Burke,Decolonization, 35–59. 10. Samuel Moyn, The Last Utopia: Human Rights in History (Cambridge, Mass. : Harvard University Press, 2010), 84–119; Jean H. Quataert, Advocating Dignity: Human Rights Mobilizations in Global Politics (Philadelphia: University of Pennsylvania Press, 2009), 72. 11. International Covenant on Civil and Political Rights, G.A. Res. 2200, 21 U.N.
GAOR Supp. 16, at 49, 53, U.N. Doc. A/6316 (1966); Vernon Van Dyke, “Self-Determination and Minority Rights,” International Studies Quarterly 13, no. 3 (1969): 223–53. 12. Telegram 415 from UK Foreign Office to UK Mission to the UN, New York, February 22, 1966, CO 936–951, UK National Archives (hereafter UKNA); Note By the Foreign Office, February 25, 1967, FCO 60/46, UN Human Rights Covenants, 1968, UKNA; Note By Foreign Office, Steering Committee on International Organizations, UN Covenants on Civil and Political Rights and Economic, Social and Cultural Rights, February 22, 1967, FCO 60/44–60/49, UKNA. 13. Eckel, “Human Rights and Decolonization,” 127. 14. “The United Nations, Self-Determination and the Namibia Opinions,” Yale Law Journal82, no. 3 (1973): 533, 541; Airgram A-229 from Belgrade to State, September 20, 1963, RG 59 Central Foreign Policy Files 1963, box 4234, NARA; Borislav Blagojevic, “Codification of the Laws of Active and Peaceful Coexistence,” Yugoslav Review of International Affairs, September 5, 1963, 9–13. 15. Declaration on Principles of International Law Concerning Friendly Relations and Co-operation among States in accordance with the Charter of the United Nations, G.A. res. 2625, Annex, 25 UN GAOR, Supp. (No. 28), U.N. Doc. A/5217 at 121 (1970). 16. Dispatch 17319 from Foreign Office to New York, April 22, 1966, CO 936–977 Discussion in UN of Principle of Self-Determination, 1966–1968, UKNA; Memo, “UK Strategy regarding General Assembly Item No. 88,” June 28, 1966, UKNA; Summary of UK Dispatch 19, 24 June 1966, CO 936–951, UKNA; Rupert Emerson, “Self-Determination,” American Journal of International Law 65, no. 3 (1971): 469. 17. Letter from Ints Runners, President of Baltic Appeal to Sir Keith Unwin, British Representive to the UN Commission on Human Rights, February 14, 1975, FCO 61–1402 UKNA; see also Memorandum to the General Assembly of the United Nations from the Estonian Democratic Movement and the Estonian National Front, October 24, 1972, UKNA. 18. Emerson, “Self-Determination”; Telegram 050616 from State to Paris, “Draft Resolution on Colonialism,” March 20, 1976; Telegram 331 from US Mission UN to State, 3 February 1971, “Future Political Status of Micronesia,” Nixon Presidential Materials, NSC Files, box 300, Agency Files, USUN, Vol. VI, NARA. See also Deanne C. Siemer and Howard P. Willens,National Security and Self-Determination: United States Policy in Micronesia (Westport, Conn.: Praeger, 2000). 19. For a discussion, see Christopher Quaye, Liberation Struggles in International Law(Philadelphia: Temple University Press, 1991); Heather A. Wilson, International Law and the Use of Force by National Liberation Movements (Oxford: Oxford University Press, 1988). 20. Telegram 78188 from State to Diplomatic Posts, December 2, 1967, RG 59, Central Files, 1967–1969, POL 19 UN, box 2575, NARA; Resolution 2270 (XXII), November 21, 1967, Adopted by the UN General Assembly, A/Res/2270. 21. Piero Gliejeses, Conflicting Missions: Havana, Washington, and Africa, 1959–1976(Chapel Hill: University of North Carolina Press, 2002), 230–31; Telegram 188050 to USUN, October 14, 1970, RG 59, Central Files 1970–73, POL 19 UN, NARA; Telegram 167826 From the Department of State to All Posts in Africa, October 12, 1970, FRUS, 1969–1976, vol. 5,United Nations, 1969–1972 (Washington, D.C., 2004), 98–100. 22. The Johnson administration came to this conclusion as early as December 1967. See Telegram 2835, USUN to State, December 6, 1967, RG 59, Central Files, 1967–1969, POL 19 UN, box 2575, NARA; Telegram 54, USUN to State, January 9, 1971, United Nations, 1969–1972, 107–8. 23. Telegram 9064 from U.S. Mission to UN to State, August 15, 1973, State Department FOIA Electronic Reading Room; Telegram 240857 From USUN to State, December 8, 1973, FOIA Electronic Reading Room; Telegram 6089 from USUN to State, USUN Unclassified Summary No. 57, December 11, 1976, FOIA Electronic Reading Room. 24. United Nations General Assembly Resolution A/RES/3246 (XXIX) of November 29, 1974. This resolution was similar in scope and tone (barring positive references to the Portuguese revolution) to resolutions passed annually by the UNGA since 1968, when the first such resolution was proposed at the International Conference on Human Rights, held in, of all places, Tehran. Summary of Discussion, “Importance of the Universal Realization of the Right of Peoples to Self-Determination and of the Speedy Granting of Independence to Colonial Countries and Peoples for the Effective Guarantee and Observance of Human Rights” (A/10156 and Add.1; A/C.3/L.2158). 25. “Self-Determination: Agenda Item 78, 30th Session of the UN General Assembly,” UN Documents Section, Foreign and Commonwealth Office, n.d., FCO 61–1402, UKNA. 26. UNGA Thirtieth Session, Third Committee, Provisional Summary of the 2131st Meeting, A/C.3/SR.2131, October 20, 1975; Telegram 5039 from USUN to State, October 15, 1975, State Department FOIA Electronic Reading Room. See also Telegram 4928 from U.S. Mission United Nations to State, October 10, 1975, State Department FOIA Electronic Reading Room. 27. Daniel Sargent, “From Internationalism to Globalism: The United States and the Transformation of International Politics in the 1970s” (Ph.D. diss., Harvard University, 2008), 420–21. 28. Telegram 16108 from State to Secretary’s Delegation in Peking, October 23, 1975, “Third Committee-UNGA Appeal to Amnesty All Political Prisoners,” State Department FOIA Electronic Reading Room; Elizabeth Spiro, “A Paradigm Shift in U.S. Foreign Policy: From Self-Determination to Human Rights,” Worldview 20, no. 1/2 (1977): 42–49. 29. See, for example, Vernon Van Dyke, “Self-Determination and Minority Rights,”International Studies Quarterly 13, no. 3 (1969): 223–53; Emerson, “Self-Determination,” 459–75; S. K. Panter-Brick, “The Right to Self-Determination: Its Application to Nigeria,”International Affairs 44, no. 2 (1968): 254–66; Ved P. Nanda, “Self-Determination in International Law: The Tragic Tale of Two Cities. Islamabad (West Pakistan) and Dacca (East Pakistan),” American Journal of International Law 66, no. 2 (1972): 321–36; Onyeonoro S. Kamanu, “Secession and the Right of Self-Determination: An O.A.U. Dilemma,”Journal of Modern African Studies 12, no. 3 (1974): 355–76; Lee C. Buchheit, Secession: The Legitimacy of Self-Determination (New Haven, Conn.: Yale University Press, 1978). 30. Van Dyke, “Self-Determination and Minority Rights,” 236; Eric D. Weitz, “From the Vienna to the Paris System: International Politics and the Entangled Histories of Human Rights, Forced Deportations, and Civilizing Missions,” American Historical Review 113, no. 5 (2008): 1313–43. 31. A search of hundreds of United States documents from the FRUS series for each country, for example, turned up not a single mention of human rights by U.S. officials in describing the situation in either Biafra or Bangladesh. Letter from the Indian Ambassador (Jha) to President Nixon, December 15, 1971, FRUS, 1969–1976, vol. 11, South Asian Crisis 1971, 833–34. 32. U.S. Policy on Human Rights and Military Assistance: Overview and Indonesia, February 15, 1978, Hearings before the Subcommittee on International Relations of the Committee on International Relations (Washington, D.C., 1978). 33. Briefing book prepared for Josif Tito on the upcoming Visit of the President of UAR Anwar El Sadat to Yugoslavia, March 3, 1972, Cold War International History Project virtual Archive, Cold War in the Middle East Collection; M. Rafiqul Islam, “Secessionist Self-Determination: Some Lessons from Katanga, Biafra and Bangladesh,” Journal of Peace Research 22, no. 3 (1985): 211–21; Nanda, “Self-Determination in International Law,” 335; Charles R. Nixon, “Self-Determination: The Nigeria/Biafra Case,” World Politics 24, no. 4 (1972): 476. 34. A. Dirk Moses, “The United Nations, Humanitarianism and Human Rights: War Crimes/Genocide Trials for Pakistani Soldiers in Bangladesh, 1971–1974,” in Hoffmann, ed.,Human Rights in the Twentieth Century, 258–83. 35. Odd Arne Westad, The Global Cold War: Third World Interventions and the Makings of Our Times (Cambridge: Cambridge University Press, 2007), 250–88. 36. “Memorandum of Conversation between Soviet Ambassador to Somalia G. V. Samsonov and Somali President Siad Barre,” February 23, 1977, Horn of Africa Collection, Cold War International History Project Digital Archive; “Soviet Foreign Ministry and CPSU CC International Department Background Report on the Somali-Ethiopian Conflict,” April 3, 1978, Horn of Africa Collection, Cold War International History Project Digital Archive; “Memorandum of Conversation between [SED] Comrade Friedel Trappen and Soviet Comrade R. A. Ulyanovsky in the CC of the CPSU,” May 11, 1978, Horn of Africa Collection, Cold War International History Project Digital Archive. 37. Telegram from Jakarta to State, August 20, 1968, “Subject: The Stakes in West Irian’s `Act of Free Choice,'” http://www.gwu.edu/~nsarchiv/NSAEBB/NSAEBB128/index.htm (accessed December 4, 2012). See also John Saltford, The United Nations and the Indonesian Takeover of West Papua, 1962–1969: The Anatomy of a Betrayal (London: Routledge, 2002). 38. Policy Planning Paper, May 3, 1974, Canberra, NAA: A 1838, 696/5, ii, cited in Australian Department of Foreign Affairs and Trade, Australia and the Indonesian Incorporation of Portuguese Timor, 1974–1976 (Melbourne, 2000), 50–52. 39. Note on Meeting With [excised], Note from New Zealand Embassy in Jakarta to Wellington, July 5, 1975, declassified document in author’s possession; Memorandum of Conversation, July 5, 1975, NSC Country Files, EAP, Indonesia, box 6, Gerald Ford Library; Telegram 170357 from State to Jakarta, July 18, 1975, NSC Country Files, EAP, Indonesia, box 6, Gerald Ford Library. 40. Petisi Rakyat Timor Timur, Departament Penerangan R.I., “Sambutan Presiden Soeharto pada upacara pernerimaan delegasi Rakyat Timor Timur dan penyerahan Petisi,” June 7, 1976, Jakarta. 41. Telegram 5688 from USUN to State, December 6, 1978 (declassified, as are the following two cited telegrams, as a result of FOIA request by author); Telegram 4899 from USUN to State, November 3, 1979; Telegram 04413 from USUN to State, October 21, 1980; Foreign and Commonwealth Office Diplomatic Report no. 182/76, “Timor: Indonesia’s reluctant takeover,” March 15, 1976, FCO 15/1709, UKNA. 42. Telegram 273978 from State to Algiers, “INR Assessment of Western Sahara Issue,” November 6, 1976, State Department FOIA Electronic Reading Room. For background, see Seerik Jenson, Western Sahara: Anatomy of a Stalemate (Boulder, Colo.: Rienner, 2005). 43. Brief no. 4 visit of Mr. Sauvagnargues to London, March 4, 1976, FCO 093–899, The Western Sahara 1976, UKNA; note from Christian Mallaby to Nigel Williams at the Foreign Office, March 2, 1976, UKNA; Note from the British Embassy in Paris, February 2, 1976, French Policy in the Maghreb, UKNA. See also the folder FCO 65–1953, Problems Arising from the Decolonization of the Western Sahara, 1977, UKNA. 44. Telegram 050459 from State to all African Posts, March 2, 1976, State Department FOIA Electronic Reading Room; Telegram 0925 from Niamey to State, March 4, 1976, State Department FOIA Electronic Reading Room ; Telegram 3200 from Colombo to State, August 24, 1976, State Department FOIA Electronic Reading Room. 45. David S. Painter, Oil and the American Century: The Political Economy of U.S. Foreign Oil Policy, 1941–1954 (Baltimore: Johns Hopkins University Press, 1986), 172. 46. Memorandum from Gordon Chase of the National Security Council Staff to the President’s Special Assistant for National Security Affairs, September 13, 1965, FRUS, 1964–1968, vol. 33, Organization and Management of Foreign Policy (Washington, D.C., 2001);United Nations, Document 367; Caroline E. Foster, “Articulating Self-Determination in the Draft Declaration on the Rights of Indigenous Peoples,” European Journal of International Law 12, no. 1 (2001): 146. 47. M. K. Nawaz, “The Meaning and Range of the Principle of Self-Determination,” Duke Law Journal (Winter 1965): 100; Vernon Van Dyke, “Self-Determination and Minority Rights,” 250. For an example, see Frederic L. Kirgis Jr., “The Degrees of Self-Determination in the United Nations Era,” American Journal of International Law 88, no. 2 (1994): 304–10. 48. Christopher K. Riggs, “American Indians, Economic Development, and Self-Determination in the 1960s,” Pacific Historical Review 69, no. 3 (2000): 431–63; V. P. Franklin, Black Self-Determination: A Cultural History of African-American Resistance, 2nd ed. (New York: Lawrence Hill Books, 1992). 49. Confidential Memo 1283 from Canberra to Commonwealth Office, September 5, 1966, CO 936–977, Discussion in UN of Principle of Self-determination, 1966–1968, UKNA; Airgram A-271 from Canberra to State, “Preparations for Nauruan Independence,” March 3, 1967, RG 59, Central Foreign Policy Files, 1967–1969, Political and Defense, box 2575, NARA. 50. Telegram 8417 from U.S. Mission UN Geneva to State, March 22, 1973, State Department FOIA Electronic Reading Room; Summary of Discussion, “Importance of the Universal Realization of the Right of Peoples to Self-Determination and of the Speedy Granting of Independence to Colonial Countries and Peoples for the Effective Guarantee and Observance of Human Rights” (A/10156 and Add.1; A/C.3/L.2158); Telegram 051057 from State to U.S. Embassy London, “Security Council Meeting in Panama,” March 20, 1973, State Department FOIA Electronic Reading Room; Telegram 9347 from AmEmb Bogota to State, November 17, 1973, State Department FOIA Electronic Reading Room. 51. The Group of 77 was formed in June 1964 as a caucus of nations, many newly independent, working to develop a common program around development issues at the UN. 52. Telegram 1003 from U.S. Mission UN to State, “UNGA Special Session—Declaration of Principles,” March 26, 1974, State Department FOIA Electronic Reading Room; Telegram 099106 from State Department to all posts, “Nonaligned Activities in International Organizations,” May 24, 1974, State Department FOIA Electronic Reading Room; William Diebold Jr., and Lucy Edwards Despard, “The New International Economic Order: A U.S. Response,” Foreign Affairs 58, no. 5 (1980): 1192. 53. Telegram 270956 from State to New Delhi, “Draft Charter of Economic Rights and Duties of States (CERDS),” December 12, 1974, State Department FOIA Electronic Reading Room ; Telegram 4709 from USUN to State, October 7, 1975, State Department FOIA Electronic Reading Room; Multinational Corporations and U.S. Foreign Policy: Hearings before the Subcommittee on Multinational Corporations of the US Senate Foreign Relations Committee, 93rd Congress, Washington, D.C., 1973; Telegram 5957 from USUN to State, November 14, 1976, State Department FOIA Electronic Reading Room. 54. Katheryn Sikkink, Mixed Signals: U.S. Human Rights Policy and Latin America (Ithaca, N.Y.: Cornell University Press, 2004), 57. 55. Though these choices were not always made for morally uncomplicated reasons. See Barbara Keys, “Anti-Torture Politics: Amnesty International, the Greek Junta, and the Origins of the Human Rights `Boom’ in the United States,” in Iriye, Goedde, and Hitchcock, eds., The Human Rights Revolution, 201–22. 56. Memo from Asia Research Department to All Sections, “AI’s concerns in East Timor,” August 1983, RG IV, box 25, Amnesty International USA Papers, Columbia University; Petition submitted by the International League for Human Rights to the Fourth Committee of the General Assembly of the United Nations, October 14, 1980, found in ETAN Papers, box 14, Tamiment Library, NYU. Daniel Sargent notes that the solidarity group American Committee to Keep Biafra Alive “emphasized the rights of Biafrans to self-determination as well as to material sustenance.” Sargent, “From Internationalism to Globalism,” 286. 57. Gunter Minnerup and Pia Solberg, eds., First World, First Nations: Internal Colonialism and Indigenous Self-Determination in Northern Europe and Australia (Sussex: Sussex Academic Press, 2011); Joseph Bauerkemper, “Sovereignty Matters: Locations of Contestation and Possibility in Indigenous Struggles for Self-Determination,” Studies in American Indian Literatures 20, no. 1 (2008): 76–79, 93; Fletcher McClellan, “Implementation and Policy Reformulation of Title I of the Indian Self-Determination and Education Assistance Act of 1975–80,” Wicazo Sa Review 6, no. 1 (1990): 45–55. 58. Hasan S. Zakariya, “Sovereignty over Natural Resources and the Search for a New International Economic Order,” Natural Resources Forum 4, no. 1 (1980): 75–84; Christopher R. W. Dietrich, “`Arab Oil Belongs to the Arabs’: Raw Material Sovereignty, Cold War Boundaries, and the Nationalisation of the Iraq Petroleum Company, 1967–1973,”Diplomacy & Statecraft 22, no. 3 (2011): 450–79. Associate professor of history and Asian studies at the University of Connecticut and the author of Economists with Guns: Authoritarian Development and U.S.-Indonesian Relations, 1960-1968 (Stanford, 2010). He is currently writing a global history of self-determination since 1945, as well as a history of U.S.-Indonesian international relations during the reign of Suharto (1966-98). Simpson is also founder and director of the Indonesia and East Timor Documentation Project at the nonprofit National Security Archive.